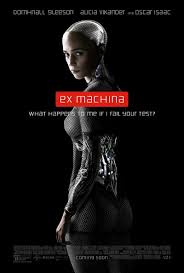 I went into Alex Garland’s Ex Machina wondering if the focus was going to be on the A.I. somehow eclipsing and overtaking the humans of the film. While this did happen, I was intrigued at the pacing of the action, finding a common denominator in almost all of the interactions with Nathan (Oscar Isaac) as he discussed the rationale behind his A.I. creation. If you’re not paying attention, you may miss the fact that Nathan needs alcohol as a coping mechanism for the act of playing god, attempting to surround himself with nature as he battles the mental concepts of that which he is attempting to accomplish. It’ll make you think about drinking. From the start, alcohol plays a constant companion in the film. We first meet Nathan as he’s practicing boxing, and he quickly moves to offer Caleb (Domhnall Gleeson) something to eat while declining food himself. Citing a wicked hangover for loss of appetite, he does not respond when Caleb attempts to be sociable and asks him how the party he attended was. The truth is far harsher than that: Nathan gets bombed by himself in an isolated location that he describes as “claustrophobic” and “a research facility.” Nathan holds himself in high regard from the get-go, congratulating himself on being such a heady meet for an employee of his company. This is someone with ego to spare and then some, but he does not seem to get social cues, especially when it comes to perceptions of praise. Enter alcohol as a social lubricant: at just about every time we get to see Nathan interact with Caleb, we see him with a beer or a bottle of vodka. In this respect, in order to have conversations about his work and what he hopes to accomplish with Caleb’s input, he needs something that will lower his inhibitions. Even with Caleb present, he still has trouble interacting with him without the alcohol. 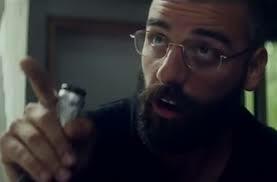 Case in point: when Caleb wanders into Nathan’s room, it is dark and he switches on a light to view the Pollock painting; what we find out in short order is that Nathan is there, drunk, with a beer. Nathan was drinking himself silly in the dark by himself. That’s not a healthy individual. Think about the context: the figure that declares himself to be god – the creator of a search engine that is used for researching and building A.I. – is actually not around people and chooses to drink into inebriation rather than interact with others. His compound is a helicopter ride away from civilization, meaning that Nathan is, quite literally, the god figure that is far removed from the masses. Do the gods require alcohol, or does one need it to achieve that state of mind? It’s the acceptance of what he’s doing – and insinuating that he will be punished for it – that requires the synthesis of nature with alcohol. Nathan requires alcohol in order to achieve an honesty that is so uncomfortable that it requires a non-disclosure agreement. All conversations about the Turing tests and the results take place with alcohol present; as time progresses, they take place against a more natural backdrop to emphasize that this is, in fact, nature’s way for the dominant species to give way to another. While juxtaposed against the high-tech, clinical nature of the compound, Nathan is effectively attempting to make peace with the fact that he has been playing god to the point of damning the human race to die out. Much like erosion, it will take time, but it is there, inevitable as the waterfall or wind blowing through the grass. In an interesting counterpoint, Nathan declines Caleb’s offer of alcohol when the testing is completed and the full intention of the test is disclosed to him. We’re left to wonder if the drinking is an act. I’m not inclined to think that it is: when Caleb tells him that he has changed the security codes when Nathan was drunk, there is genuine surprise on Nathan’s part. Nathan has created a being that can pass as human enough for someone to want to help; he feels that the human race will fall to this, and for his own safety, he keeps the A.I. locked up and hidden from windows. These are the actions of someone attempting to come to terms with what he’s done. In the end, we’re a step closer to his prophecy, if only because he lacked the dscipline to stay both sober and honest simultaneously.